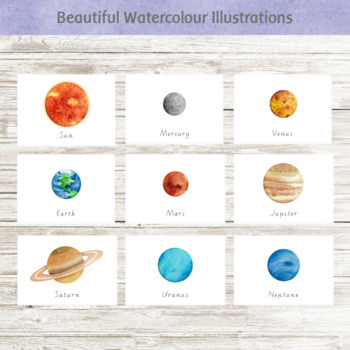 This set of 10 watercolour solar system flash cards can be can be used for a wide range of learning activities and games, both at home and in the classroom. Print two sets to play Solar System Memory Match or print four sets to play Solar System Snap! Perfect for teachers, homeschoolers and parents. Includes Sun, Mercury, Venus, Earth, Moon, Mars, Jupiter, Saturn, Uranus and Neptune. These printable cards are a digital download. Once you have completed your purchase you will receive a link to download the product in PDF format. No physical product will be sent.